When we received an invitation to a wedding at the Wychmere Beach Club, we started looking for a place to stay. Honestly, I was a little underwhelmed at my options at first. The rental homes were expensive and a little shabby looking…plus I didn’t want to deal with groceries and cooking. The hotels within a reasonable distance from the wedding venue weren’t that impressive as well. I was feeling a little discouraged about my search…until I found The Platinum Pebble Boutique Inn. Cozy, stylish, clean, well decorated, luxurious, etc. etc. THIS was what I envisioned when I dreamt of a quintessential Cape Cod vacation! From the get-go (aka before we arrived), it was clear what type of service we could expect. I called to reserve the room and Mike was so patient and so friendly. The week before our trip, Stefanie called to go over our breakfast preferences and ensured we knew what to expect. They, and the inn, were both just as wonderful in person. The entire inn was gorgeous but our room exceeded all of our expectations. Everything was spotless, the bed was SO comfortable, and our recently renovated bathroom had a gigantic and spa-like shower. A gourmet breakfast, delivered to our room at a time of our choosing, was the most incredible way to start every day. 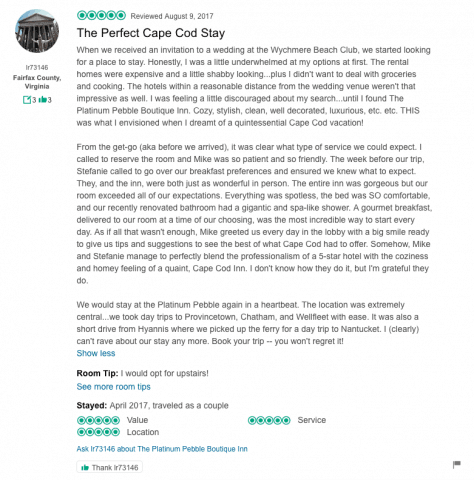 As if all that wasn’t enough, Mike greeted us every day in the lobby with a big smile ready to give us tips and suggestions to see the best of what Cape Cod had to offer. 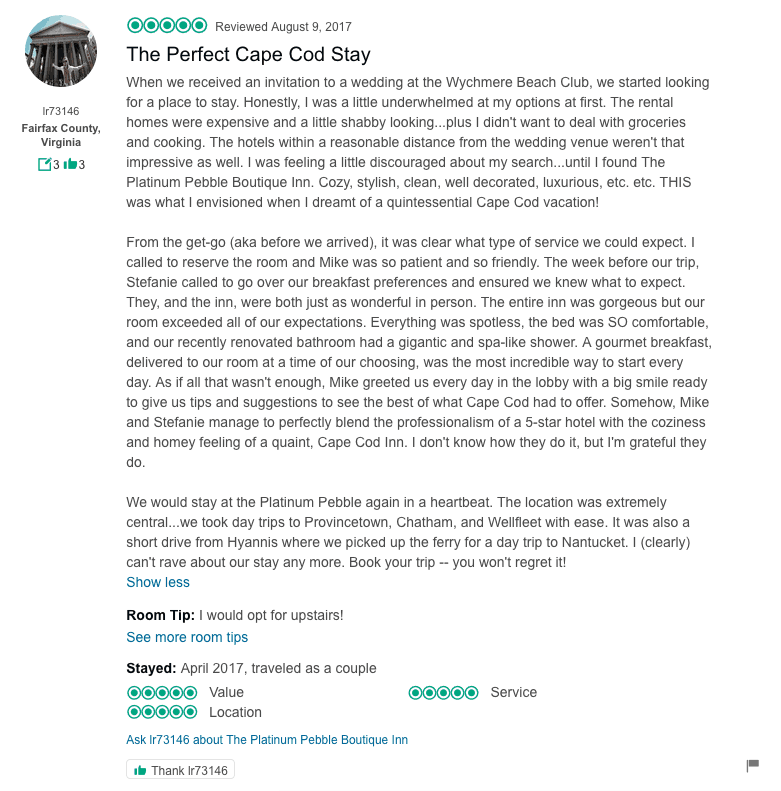 Somehow, Mike and Stefanie manage to perfectly blend the professionalism of a 5-star hotel with the coziness and homey feeling of a quaint, Cape Cod Inn. I don’t know how they do it, but I’m grateful they do. We would stay at the Platinum Pebble again in a heartbeat. The location was extremely central…we took day trips to Provincetown, Chatham, and Wellfleet with ease. It was also a short drive from Hyannis where we picked up the ferry for a day trip to Nantucket. I (clearly) can’t rave about our stay any more. Book your trip — you won’t regret it!